Materials: Kona Cottons by Robert Kaufman in snow, stone, honey, ice peach, lipstick, coral, curry, zucchini, peridot, bluegrass and ultra marine. 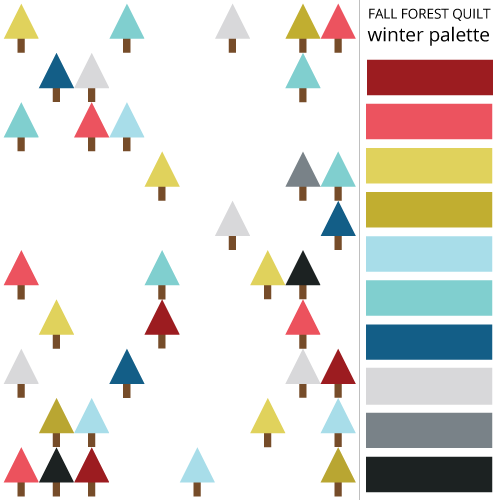 The idea for this quilt started as soon as the seasons began to change from Summer to Fall. 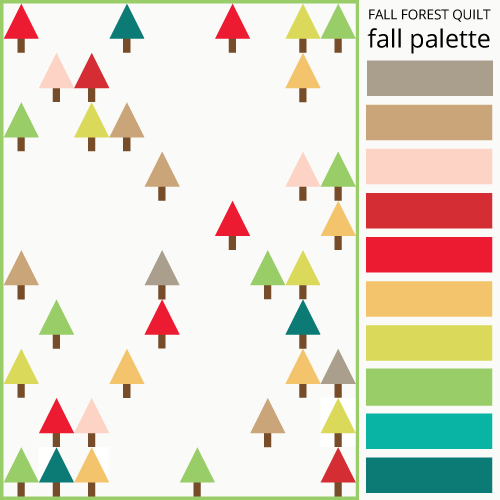 I pulled out my Kona color card and picked the dreamiest fall palette I could think of and then I had to decide what to make. This design came to me in my head before I could even get a pencil to sketch with. 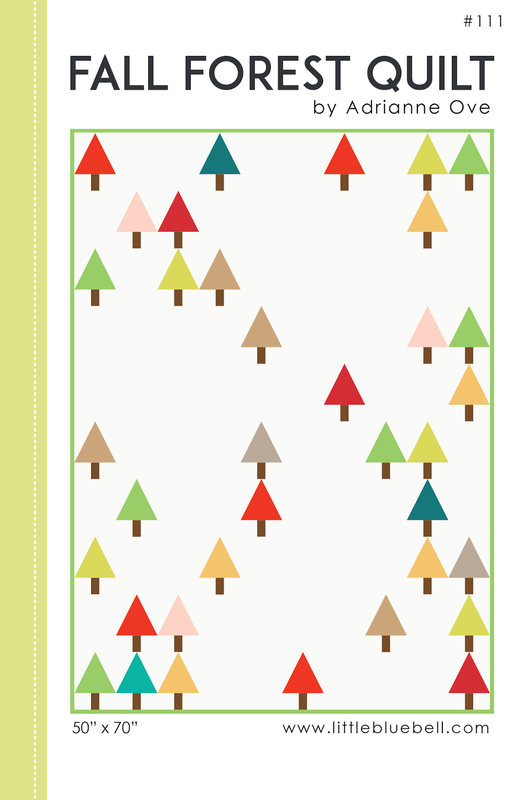 I knew I wanted simple graphic trees in all of the colors and lots and lots of negative space. My Tri-Recs tools were perfect for this. They made super quick work of cutting out the triangles and half square rectangles with my rotary cutter. When I shared what I was working on, some sweet friends asked if I would please make a pattern. Of course! : ) So over the last couple of weeks I worked on the quilt by day and the pattern by night. And I'm proud to say after a lot of work, they are both finished. It's a full color printed pattern that includes instructions to make your own quilt, diagrams, color suggestions, templates and a coloring page to customize your own design. 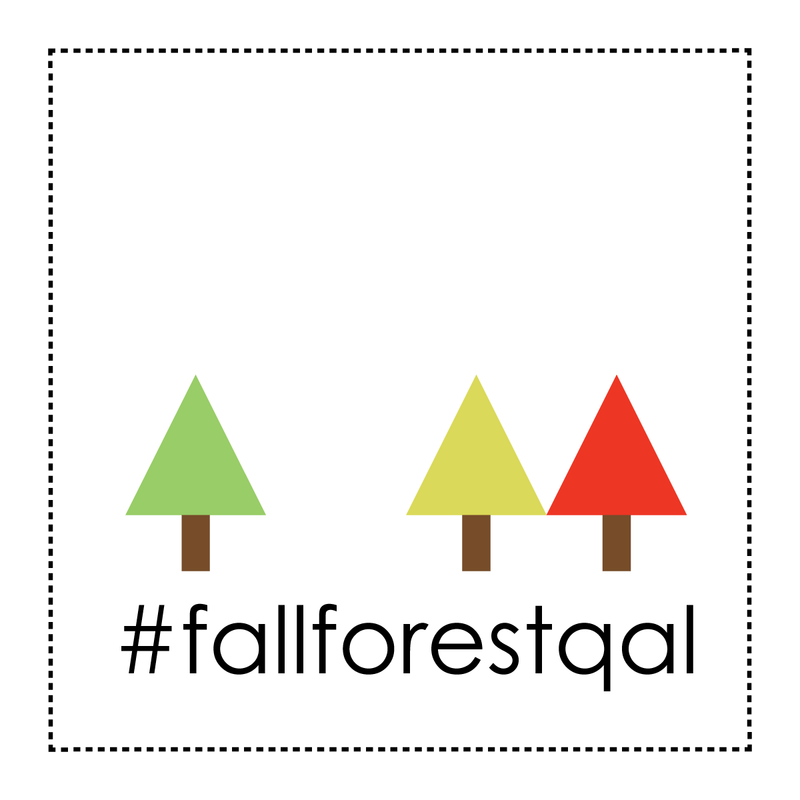 Not long after I cut out my fall colors, I started thinking how the forest would look in winter. It turns out it's a modern winter with juicy reds, sour greens, icy blues and misty greys. 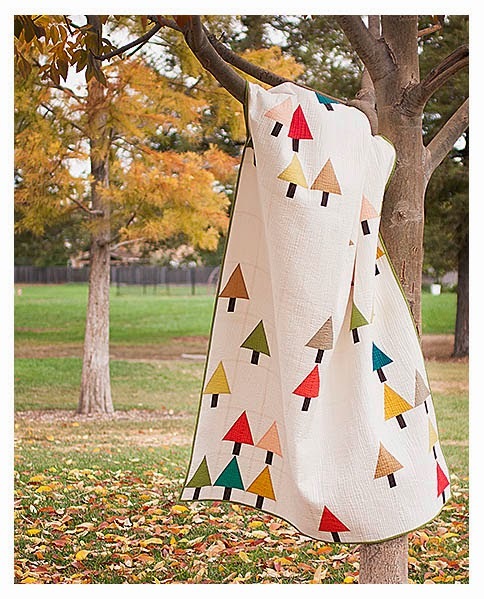 I partnered with The Intrepid Thread to stock everything you need to make this quilt from the handy Tri-Rec tools, to all of the Kona cottons (in both the Fall and Winter color palettes) as well as the pattern itself. They have the kits available here and if you order before November 6th, there is a 10% everything sale with promo code: MAKEROOM. A very special shout out Carol, Carol and Marcia. Thank you ladies for all of your kind words and support! OH MY I LOVE THIS QUILT!! I'd love to order the kit from Intrepid Thread the only thing holding me back are the "TRIANGLES". Aaacckkkk.....Never done one but would really like to give it a whirl. Do you think this is something an intermediate quilter could do? Yes, you can totally do this! 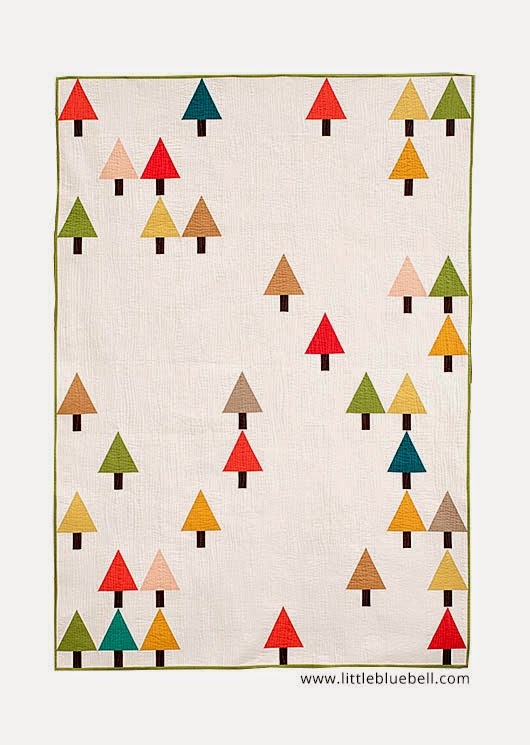 This is actually even easier than some of the triangle quilts you may have seen. 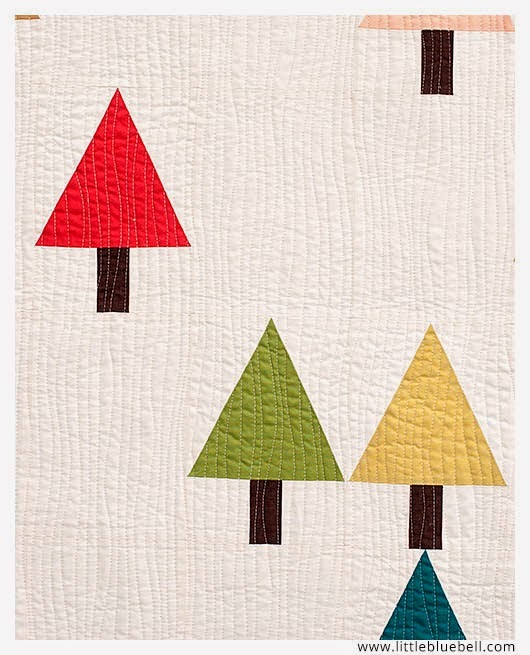 The trees tops are sewn as triangles inside of squares so when you sew all the blocks together to make your quilt top, it's all straight edges again. I really recommend getting the kit with the Tri-Rec tools. It makes cutting everything out a breeze!! LOVE this and it's a perfect size! I love this! Can we just buy the pattern from somewhere? ok I have been enabled and purchased the kit with the ruler. I am thinking this will become a wall hanging in my bedroom. I saw this on Julie's blog. Now I just need to see if I have the ruler. I think I bought it once. Love the fall palette best! I just want to make sure I have the right ruler before I order a kit from Julie. My triangle says "tri tool" and is 6.5 inches tall and the half triangle ruler says "recs tool" and is 6.5 inches too. They both say designed by Darlene Zimmerman and Darlene Hoffman. Thanks! I'm not on Instagram yet but figure this will be a good reason to get an account.